We have just set up our Christmas tree. I can’t believe it but in a few weeks, Christmas will be here! What a wonderful way to welcome this season though an in-depth study of Christmas from Homeschool Legacy. 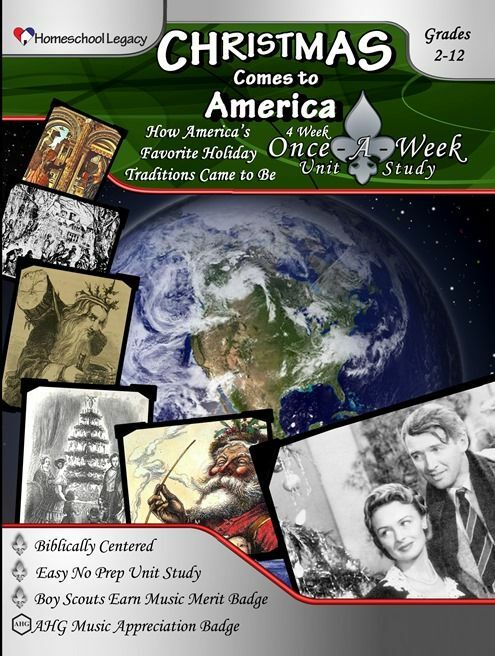 We are reviewing this Once-a-Week Unit Study Christmas Comes to America through the Homeschool Review Crew. Homeschool Legacy is a product by Sharon Gibson, a homeschool mom of 16 years who believes that unit study approach is the best way to help children learn. Unit study provides a fun and creative atmosphere for the children to learn. Through unit studies, different subjects can be tackled while studying a single topic. Most of the time, you can incorporate language arts, grammar, spelling, history, social studies, science and math lessons as you study the topic. It is also good for multi-level families as everyone can study and make the activities together. It builds relationships and makes more memories for the family. The Once-a-Week Unit Study Christmas Comes to America is biblically centered. The main source of the Christmas story is the Bible though throughout the weeks, you will be taught how Christmas traditions have originally started in different countries, the customs, symbols and traditions of the Christmas season. It is also easy to implement as virtually no preparation is needed. Everything has been researched, listed and scheduled for you already. It is very easy to incorporate into your schedule and as mentioned, you can do it once-a-week. To make this unit study more interesting, they have provided a list of books you can read while doing the lessons. There is also a list of videos that you can watch during Family movie nights to further enhance the learning experience. The lessons also incorporate ways for the Boy Scouts and American Heritage Girls to earn their badges while doing this unit study. The material is good for the entire family and is best suited for grades 2-12. You will receive the material in PDF format so you can read the material in any mobile device or through your computer. The lessons are divided into 4 weeks. Week 1 tackles The Dutch. The proposed schedule is that the children do independent reading daily while the family meets once a week to discuss the devotional. Then as suggested, children are encouraged to research the history of one tradition per day throughout the month. The origin of “Santa Claus” according to the Dutch was also disclosed. There are some activities for language and then cocoa-making for life skills. This was probably the favorite of our family! At the end of the week, you are encourage to watch a classic Christmas movie. Week 2 is all about The English. It begins with individual reading daily and the family meets to discuss the devotional. The English discusses the origin of St. Nicolas and the tradition of singing Christmas carols. The making of Christmas cards is discussed and encouraged at the end of the lesson as well. Week 3 focuses on The German. Ever wondered what “Christkindl” meant and what it stands for? This lesson would help your family understand that. It also features many of the symbols associated with Christmas like the trees, ornaments, tree lights, advent wreaths and the stockings. Week 4 features The American Christmas. It includes the same activities as with the other weeks and at the end, you will be encouraged to create an after Christmas tree for the birds. Definitely, an activity that the children will love! If you are interested to learn more about the the history and diversity of the U.S., you may check out the Once-a-Week Micro-Studies: Many Nations . This study would let you know more about the different Nations of Native Americans in the U.S. This downloadable product only costs $14.00. If you are looking for a unit study with no frills on Christmas and one that is easy to implement, then you should go ahead and purchase this unit study. The activities listed are definitely going to make Christmas more memorable for the entire family and make each one appreciate all the Christmas traditions that they have been doing all these years. Join the 2017 Homeschool Review Crew! For the past 4 years, if you have noticed, I have been regularly reviewing great homeschool products though the Homeschool Review Crew. It has been a great experience for me because I get to use many different curriculum that we would have no access to if we weren’t part of the crew. What I like most is being able to share these great products to my readers in the Philippines. There is a growing homeschool community here and we are all on the look out for great curriculum which can help our children learn. For the coming year, if you would like to become part of the crew, your chance has arrived. You may now apply by visiting this 2017 Crew Applications post. I assure you, being part of the crew will be a great opportunity for you to grow as a homeschool blogger. Learning different languages has been part of our homeschool. This year, as part of the Homeschool Review Crew, we were given a 6 month access to Middlebury Interactive Languages. My 7th grade daughter wanted to learn a new language so she chose to try the Middle School German 1 class. Middlebury Interactive Languages is not new to our family. We have actually tried the Elementary Chinese Course a few years back. We loved how the program uses the immersive approach in developing one’s skill in languages so we were quite excited how the Middle School German 1 course will help my daughter understand German and appreciate Germany’s culture. Middlebury Interactive Languages offers K-12 Language programs in French, German, Chinese and Spanish. Each language has elementary, middle school and high school courses. Though the products are not credit bearing, the lessons are aligned with the standards of the leading world language and digital learning organizations (ACTFL and iNACOL). The courses are designed to deliver a holistic learning approach through reading, writing, listening and speaking activities in digital format. 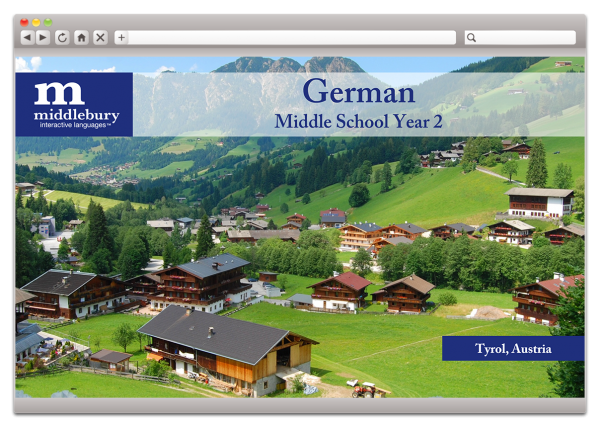 The Middle School German 1 course consists of 18 weeks or units (90 days) of content. In each unit, there are 10 lessons. There are 2 semesters and for each semester, there is a midterm and a final exam. This is a self-paced program ideal for 6th Grade-8th Grade students. The program is good for beginners. The course introduces common vocabulary terms and phrases. At the end of the course, students should be able to follow the grammar patterns, participate in simple conversations and communicate using basic conversational phrases. Using the system is fairly easy as you only need to have a stable internet connection and a browser to access the program. Upon log-in to the system, the student will see the dashboard. The lessons that she can learn for the day will be displayed here. You may also check the Table of Contents to see the entire course. There is also a calendar where the lessons are already scheduled daily so you can finish the entire course on time. But this is just a recommendation, you may choose to go faster or slower than the recommended pace. The lessons are very visual but it is also good for auditory learners as there is a green button where you can play the audio file of the entire slide. The lessons are very interactive too. You can answer the questions thru the drop down menu and there is an auto-correct button to see if your answers are correct. The left side of the screen shows the slides that you will be studying for the entire lesson. You can move forward or go back as you may want to review old lessons. The lessons also include cultural topics. This allows the student to get immersed on the culture of the language as well. It creates an awareness of the different lifestyle of the German people. There are some videos of the architectures that you can find in Berlin, Germany too. The pop-quiz results are recorded in the gradebook section. If you need to see the grades of your student, then this is the place to go. 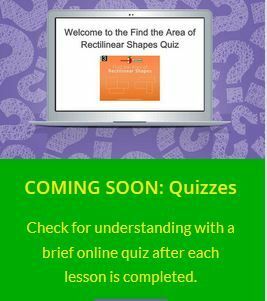 If you want to see what your student has completed, you may also browse through the different slides of the lessons and see which ones has a check mark which signifies your student has completed the lessons. Product requires minimal parental supervision. Thorough language lessons yet very holistic in approach as it includes a study of culture as well. Systematic and step-by-step lessons easy for beginners to understand the language thoroughly. The product without teacher support is being sold at $119 only. If you need teacher support, there is an option to get teacher support with a higher fee. For more information, please follow the social media accounts of Middlebury Interactive Languages! To read the reviews of the Homeschool Review Crew on other products of the Middlebury Interactive Languages, please click on the image below. A homeschooler is always looking out for great resources. Educeri ……. 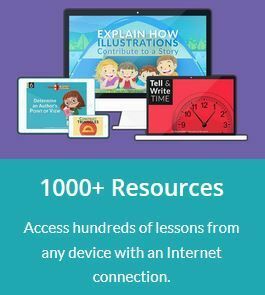 Educeri a division of DataWORKS knows that and they created over 1000 ready to teach lessons available for anyone who wants to learn more with their Educeri Lesson Subscription Service . As part of the Homeschool Review Crew, I received 12 months of access to this great wealth of information. Accessing Educeri Lessons is fairly easy as long as you have Internet connection. You may visit their website using your browser on any mobile device or your computer, whether it’s OS is Mac or Windows. You just need to login and you are on your way to accessing over 1,000 lessons! It includes Math (413 lessons for all grades), English Language Arts (525 lessons for all grades), Science (22 lessons, mostly middle-high school), History (26 lessons, mostly 5th grade and up), Art, PE, and Music (only 1-2 lessons each). The lessons are for K-12. My son is in 4th grade and I asked him to look through the different lessons. We just clicked on the drop down menu and chose 4th grade. Automatically, the display showed 112 lessons that he can choose from. I asked him to choose a topic for Math that he is currently learning about and we chose “Create a List of Factors”. After showing the theory, there are several slides with practices where the student can try to answer. The student can do the exercises in paper and they get to see if their answer is correct by pressing the next button. If you want to see all the slides, you can click on the bottom left side and navigate through the slides. For this lesson, there was a total of 13 slides. It took my son about 15 minutes to finish the entire lesson. For 4th grade English Language Lessons, we checked on the Cause and Effect lesson. Here is a sample of the activity that the student can try to answer. The answer is also shown on the right side of the screen. For this lesson, there is a total of 17 slides. The last 6 slides are all practice for the students. Should you want to study the lessons offline, you may also choose to download the file as a PDF file and print on your printer. This great resource can be paid through the monthly subscription fee of $7 per month or annual subscription fee of $75 per year. If you are unsure, you may start with a 30-day free trial first. I think that this is a good resource for a fair price of $7 per month. There are several exercises per topic specifically for Math and Language lessons. If you need help explaining certain topics, Educeri has created a good product to assist you. Maybe in the future development of this product, they can think of adding voice features to make the slides even more appealing to the auditory learners. Here are some more features to watch out for as well! If you want to know what the other Homeschool Review crew thinks of this product, click on the banner below. With the different security threats we encounter in cyberspace, it can be scary to give our children their own email access. 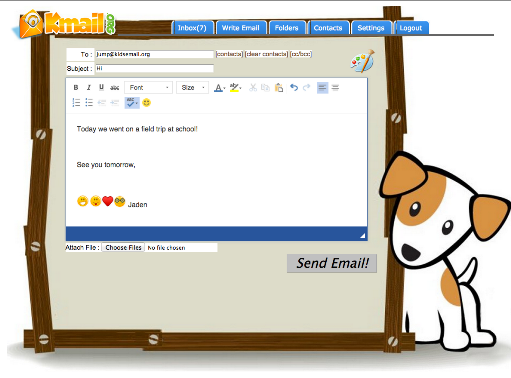 KidsEmail.org knows the hearts of parents so they came up with an awesome idea! My kids can now email safely using KidsEmail.org ‘s Annual Subscription. KidsEmail is safe email for children. As part of the Homeschool Review Crew, I was given an Annual Subscription to their service. I was given parent access and created 2 emails for both my children. After creating their accounts, I immediately checked the features and the settings. I was thoroughly impressed with what KidsEmail offers. It was just what I wanted for my children, a safe way to email. Parents can monitor the emails that each email account receives and send out.You can change settings to allow you to receive a copy of every email they receive or send out. This is important to me because while my children are young, I want to protect them from people who might want to exploit others or from hackers who want to steal identity. I actually discussed this feature with my 12 year old and 7 year old so that they would know about threats they might encounter online. I believe that as we go forward doing this, we are building accountability and trust in each other too. Parents can restrict offensive words, ads, links, images or attachments. We all know how phishing happens. It is important to keep our accounts safe and to avoid being led to suspicious websites that are secretly getting our passwords and other information. Being able to restrict ads, links, images or attachments leads to lesser chance of phishing.Offensive words can also be filtered out before children receive their emails. While children are not yet able to discern what is right from wrong – this feature is a must. Parents can manage the family’s activity in one page.I don’t have to go to several pages separately and can actively manage everything from my parent control page. I can change restrictions and see the activity logs of every email account under my parent account. KidsEmail can be installed as an app on any device.I can install KidsEmail on my children’s iPad so they can easily retrieve their emails while they are on the go. They don’t have to borrow my computer to login from the web browser all the time. This gives them freedom to email anytime they are allowed to do so. Parents can set the time when the children can access their emails.Time restrictions feature is very detailed as you can change the time allowed per day. This is very useful especially if the app is installed on their device. Email can only be checked on certain times of the day to avoid interruptions from school work. Parents can easily manage the contact list.There is a setting in which the child’s email account can be set to receive emails only from those included in their contact list. If you have enabled this, it is important that you manage the contact list to ensure that the emails will arrive. If you have multiple accounts under your parent account, you only need to enter the email once and choose to “add for all children”. There are several screen design options but my children being dog-lovers like this the best! The monthly price for KidsEmail’s Annual Subscription is just $4.95 which gives you 4 email accounts already. If you want to try it out first, you may get a trial account for 30 days. To read more reviews about KidsEmail.org from other Homeschool Review Crew, please click the banner.